Not for the first time this season, Philippe Coutinho was left on the bench by Ernesto Valverde, as Barcelona were held to a draw by Girona. As seen against Alaves and Real Sociedad in La Liga and in the Super Cup previously, the Brazilian playmaker started on the bench for the Catalan giants before being introduced by his coach. Given the quality that he possesses and the pursuit it took to prise him away from Liverpool, there is a valid argument to be made that he should expect a more prominent role and perhaps even be one of the first names on the team sheet when available. 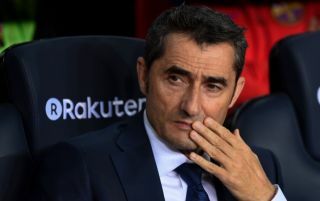 However, Valverde evidently isn’t seeing it that way and as noted by The Express, he has recently tried to explain the reasoning behind his decision to not always give Coutinho a starting berth. It appears as though the questionable tactic is set to rumble on, and according to Don Balon, the 26-year-old is unsurprisingly unimpressed with it as he’ll be keen for a prominent role for the reigning La Liga champions. Having been left baffled by the decision prior to Sunday night’s encounter, Coutinho is still said to be struggling to understand it and so it remains to be seen whether or not the situation deteriorates further if Valverde sticks with his plans. Given Barcelona were at home and were expected to dominate possession, Coutinho would arguably have been an ideal figure to have in the line-up to keep possession and probe for breakthroughs in the final third. Instead, he was forced to watch on from the bench until the 58th minute and after Clement Lenglet had been sent off in the first half, Barca were unable to come away with a win as they dropped their first points of the campaign. Coutinho is so badly misused by Barça. Will never reach the levels that he did at Liverpool whilst having to play under Valverde. Second most creative player behind Messi and more than capable of controlling games and dictating the tempo when played in the correct position. Third time in five league games Coutinho’s been asked to come from the bench to turn things around.